Silex's new WiDock connects to your wireless network to sync up your iPod sans cables. Why this hasn't been built into Apple's iPod dock already I can only guess, but thank God somebody is on the ball. It even supports security standards like WEP & WPA. 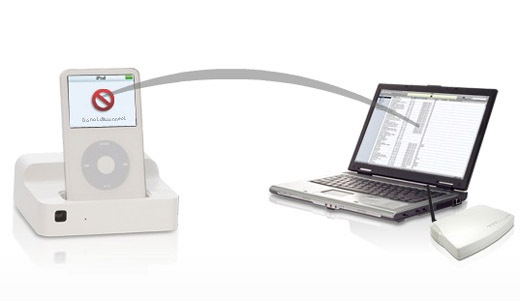 The dock, which can also be connected via Ethernet, has all the traditional features of an iPod dock like the ability to plug into a stereo/TV and charge your iPod while its docked. Hopefully the setup will be easy to use because I'm sick of looking for iPod cables, especially since Apple quit supporting FireWire and made a good portion of them obsolete. Or else the little dock that could, could end up loosing some of its charm. The WiDock works with all iPods with a dock connector and will run you $149 starting in December.